No, the VPDpro tool has not been published yet. If one day it is published, it will be on http://www.renoise.com/tools/browse.Iam currently trying to improve the code and add small things. Anyway, this tool has so many things that it can be overwhelming at first. The tool needs a small manual, and that is not yet built.The tool has a very personal touch. It is not designed to please other users, but for myself. But yes, I will not mind sharing the tool when I think it’s ready to be published. Chord names are better classifieds. Colors added in the pads to detect them more quickly with the eyes. Now, MIDI Input accepts the pulsation of several chords, without the previous one remaining sounding, as long as you do not change the instrument in the live recording. 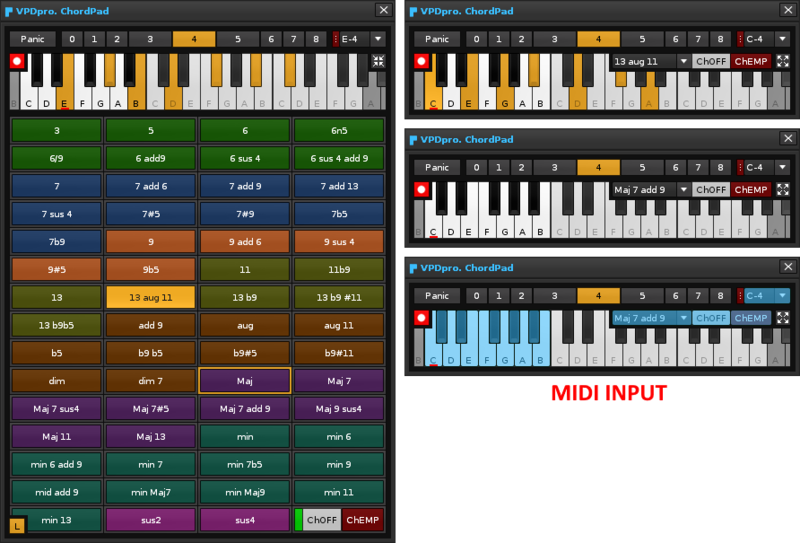 This is the new aspect of the ChordPad window. I am very proud to have built this tool! And so you should be, Raul, looks amazing, and thanks for adding colour to the pads! What … did you say tomorrow just then?